During the 1950s and 1960s racing specials were a common sight at race meetings in Europe and the US where they competed head to head with considerable success against the very best that the mainstream auto manufactures could offer. Often hybrids by design, these specials were built from combinations of the preferred equipment available to the motoring public from their era, and are generally one-of-a-kind, often amounting a colorful history competing against household names from the motorsport industry. This particular car is a Jaguar-power special built during the winter of 1959 by John Wilks and first campaigned in 1960 at the Stapleford, Essex hill climb by Mr. Wilks himself. It is a tubular space-framed in construction, with an all aluminum body. During most of its career it has been motivated by a Jaguar 3.4L powerplant with 3 SUs, a Jaguar (Moss) gearbox, early Austin Healey rear axle on uniball jointed trailing arms and ‘A’ Bracket, double-wishbone front suspension, front disc brakes, rear drum brakes, rack & pinion steering, and 16 inch wire wheels. For the period of its construction, it was a decidedly modern equipment package. It was a sports racing car in nature, and road registered on 6 RPE plates. 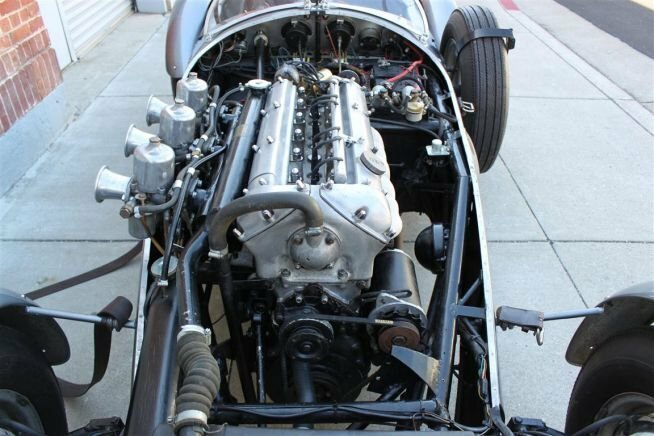 During the winter of 1961/62, the 3442cc Jaguar engine from a crashed MkVII was fitted. At one time it had independent rear suspension, using the driveshaft as the top transverse link, and in that form it was used for one “very frightening” race at Brands Hatch. An Austin Atlantic axle was later used and the car was campaigned in all forms of competition, from Formule Libre races at Silverstone and Snetterton to the Brighton Speed Trials and hillclimbs at Prescott. In 1963, the Omega was bought by John Miles (later a Lotus F1 driver). Miles raced the car at Debden, and won his class before selling it to Eric Liddell, who owned it for a few months before selling it to Stanley Morrison of Glasgow, who had Graham Birrell’s garage look after it. It is thought that the Birrells also raced it. Stanley Morrison, the forth owner, competed in it twice but found the Omega to be too capable for him. While he owned it Sir Jackie Stewart drove it once, and his account of the events are described in a letter from him within the historical file. In late 1967, while in Glasgow for Christmas, long-term owner Chris Wilson searched for the car, found the owner, Tim Morrison, and bought it from him. After some work on the car (it was missing the front wings and headlamps), Mr. Wilson drove it from Scotland, down to Chris and his wife’s house in Essex. Chris was 23 years old, newly married, and with little money. He and his wife used it to go to work in (to the Ford R&D Centre, Essex) and used it for one or two trips before taking off the road in late 1968. They then kept it off the road until they could afford to restore it. In 1985 Mr. Wilson dismantled the car and a toolmaker friend, Bob Head, restored all the mechanical components, excluding the gearbox and the differential, which were outsourced. The instruments were restored by an instrument restorer. In 1987 the components and the chassis with its bodywork were then given to Buskell Engineering who then removed the body, checked the chassis and repainted it. Mr. Wilson’s major objective in the restoration was to have it restored without any changes from the original form. The same approach was taken throughout – for example the original instruments were restored and their position in the dash exactly retained. The body was painted and the car re-assembled. The car was finally back on the road in 1995. Chris and his wife used the car for about 1000 miles. Some years later, in 2003 Chris had the gearbox overhauled again by Alan George (top Moss gearbox expert). Mr. Wilson also obtained the correct 3.66:1 differential ratio. In 2009 Don Herridge re-fitted the back-axle and gearbox, re-positioned the headlamps to the correct (lower) position, and prepared the car for the road. The car was back on the road in early 2009, and had done about 300 miles before being sold in 2010 the present owner, a North American based and highly respected Jaguar “C Type and “D Type” expert. Cosmetically, the car presents very well. The paintwork makes a strong impression, and the hand formed body is in good order. The interior is nicely trimmed in high quality upholstery, which is further complemented by the fitment of period Smiths mechanical instruments. The Omega is in good mechanical order as well. The cars starts easily, revs freely, and has a decidedly competition feel to the driving experience. The 3.4L engine supplies more than enough torque and horsepower to keep even the bravest and most talented driver’s attention, and thankfully, it has disc brakes on the front corners. Its small size, and lightweight, minimalist, aluminum body further enhances the power to weight ratio. Ergonomically speaking, form clearly followed function, and the layout of the car was primarily based around mechanical requirements and weight distribution. Truly a well documented period Special, included with the car are many period photos, a letter from Sir Jackie Stewart noting his involvement with the car, key quotes from previous owners describing its history, their involvement, and driving impressions, the Omega’s competition history, the Omega’s competition press cuttings, programs from two events, a 750MC Bulletin dated April 1964, A historical summary and list of specifications, letters and transcripts from John Wilks, letters from Stanley Morrison, letters and notes from Eric Liddell, Chris Wilson’s summary: “My life with the Omega”, press cuttings from Bill and Phil Buskell, an article in Classic and Sports Car, letters from Doug Nye a draft of the FIVA application, notes from Alan George – gearbox expert, copies of the UK Registration documents & some insurance documents, and invoices dating back to the 1980s. By virtue of its 1960 completion date, the Omega is eligible for some of the world’s premier road rally events, not the least of which is the Colorado Grand, where this special-motivated by the torque of the Jaguar straight-six, is sure to be a brisk and spirited ride. Alternatively, it is also eligible for a great number of historic racing venues where it should prove competitive among cars from the late 1950s and early 1960s, and will certainly be an interesting conversation topic within the paddock.